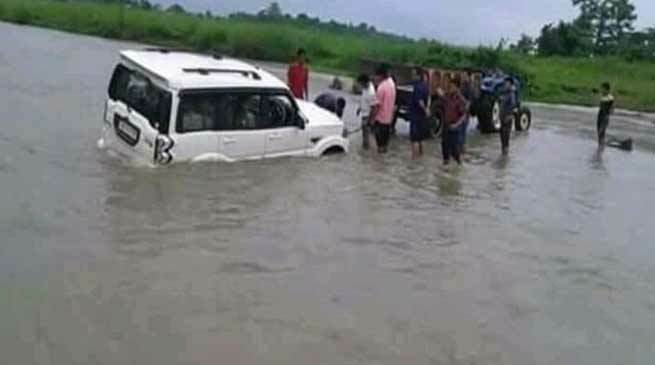 The heavy rain, Landslides continue in Arunachal Pradesh, so far 13 persons have lost their lives, almost all rivers and Nallahs are over flowing. The Papum Pare district and Capital complex district administration have appeal the commuters to maintain precautionary measure in monsoon and while driving so that any accident do not takes place. The information received from different sources said that there have been landslides at various location in the state including capital complex. So far 13 precious lives have been lost in the state due to landslide related incident in state which include 8 dead in two accident near LIkabali in Lower Siang district, 5 died when the wall collapse near Ganga Market in Itanagar. Due to heavy downpour and torrential rain almost all the rivers and Nallah are on spate and inundated several low lying area and there are dangerous and threatening the life and property of the people living on its bank if the precautionary measures are not taken, there is also need of extra vigil by the family members and administration. The information received from different sources said that road between Hollongi to Balijan blocked due to huge discharge of water from Magoni and other river. Doimukh to Sagalee and Seppa via Hoj is blocked due to landslide at various location near Hoj and other area near area. Doimukh to Potin – Ziro is blocked at Kalamitti and several other location due to massive landslide, however the Doimukh Highway division officers led by man and machine of TK Engineering Consortium Company are at job but the frequency of the landslide is very big and at multiple location and it continue to occur due to heavy downpour. Kimin to Potin is blocked due to landslide and falling of rock at three location though the GREEF personnel are engaged and trying their best to restore the road. The road from Yupia Tinali to Borum is through but very risky as the landslide which disrupted the communication recently is still to be cleared and the capital Police have to deputed security personnel to guard the spot for safety and security of the commuters as the place is very risky and untoward incident could be happened any time and the traffic movement can be disrupted. Few roads in capital which include Hollongi to Itanagar is cleared and few landslide which occurred near Hollongi and at few other location have been cleared by the Nirjuli Highway Divison with support of man and machine of TK Engineering company. Doimukh to Sagalee and Seppa via old road is through and many commuters are preferring the said road to go to Seppa. Doimukh to Harmutty via Gumto is through and clear while construction is going on and is being carried by Nabam Tullon LLP company upto Harmutty Market try junction. NH-415 from Banderdewa to Nirjuli – Naharlagun – Itanagar including via Jullang and Chimpu is through and anyone who prefer to toward Guwahati and Tezpur can avail the said road but traffic flow have been increased due to the road construction of NH-415 from Itanagar-Naharlagun and due to muddy near Dree ground, 6 kilo and few other locations. Meanwhile Papum Pare district Deputy Commissioner Dr. Joram Beda in an executive order issued today based on the information of the Doimukh Highway Division with regards to clear the landslide at chainage 1.00 KM of Papu-Yupia road with heavy machinery on July 7 and regular traffic shall be closed down completely to avoid any untoward incident. The Executive Order issued vide order No-JUD/0878/2018 today order for total closure of traffic movement including two wheelers from Papu Nallah Tinali to Sood toward Yupia from 7 AM to 7 PM on July 7. However Capital Complex Deputy Commissioner Prince Dhawan have appeal the denizens of capital complex to maintain precautionary measure in the monsoon season. He said that there is a need to maintain vigil as we cannot fight nature but can remain safe and secure if we maintain precautionary measure and stay away from landslide and flood prone area and other vulnerable area. He said that capital district administration is alert and ready to face any eventuality. Dhawan added.